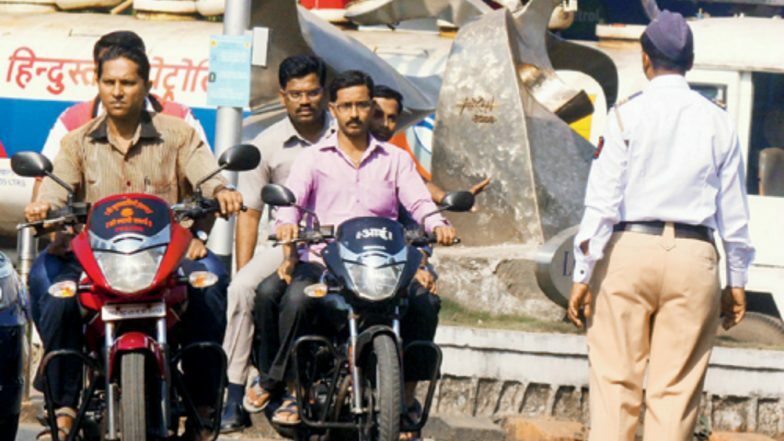 Mumbai, March 22: The Mumbai Police, assisted by the Traffic department, led a special drive for Holi to nab those involved in "drink and driving" and traffic violation cases. According to the Hindustan Times, as many as 10,675 cases of traffic violations were recorded on Thursday, March 21, making it one of the highest ever in a single day. Using Mobile While Driving or Jumping Traffic Signals on Mumbai Roads? Your Licence Will be Suspended For Three Months. The report said that the 16-hour action by the Mumbai Police also saw 725 vehicles seized. People were also booked for having two pillion riders and for rash driving as well. On Holi, Delhi Police Receive over 4,000 Calls of Quarrel-related Cases. Whereas in Delhi, celebration for the 'festival of colours' were loud and enthusiastic on Thursday with people smearing colours on each other and exchanging greetings and sweets. The Delhi Police issued more than 13,000 challans for violation of traffic rules, including drunk driving. According to news agency PTI, the number of challans issued by the police increased by around 4,000 this year, but the total number of drunken drive cases reduced by 300, a senior traffic police officer was quoted saying.